Deleting files in the trash box in an Apple macbook is entirely differently than securely deleting it, as many secure files are hidden and not deleted when you normally empty the trash. The same is the case with external hard drives, where everything is not deleted, when you empty it. And that’s why there is an option of securely deleting the trash box in your Mac, or else if you delete the trash, the secure files remain intact. 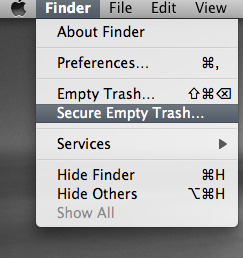 You would get the option “Secure Empty Trash…” from the Finder menu in your MacBook. Just select it and everything is perfectly cleaned in your trashbox. 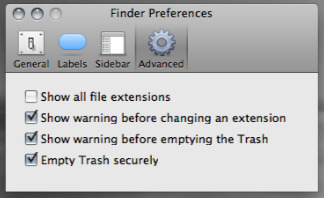 This default option of deleting the trash is not setup already, and you have to do it. Go to preferences in Finder menu, and in it, go to the Advanced section. There you will have a last option of “Empty trash securely” which you have to mark and then whenever you empty the trash, it is done in the advanced manner by deleting the secure data too. This would be more helpful for those who are sharing their empty external hard drives, and you should surely empty your drives securely. Generally when you are just emptying trash as it is full, i don’t recommend securely emptying it. A general empty trash feature would be fine for then, but security is needed when you are in some sharing process with others. I often use the ‘secure option’ to erase my deleted files though the process can be quite long compared to a normal empty trash.